Your tax-deductible donation of new or gently used clothing for the poor is always appreciated. In addition so are household items in good condition and toiletries. The Distribution Center provides these items to the poor five days a week. 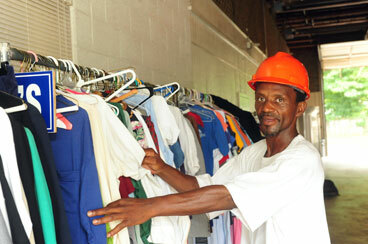 The Distribution Center welcomes the poor who need clothing and other household items, free of charge. Now and then, our program directors look for a benefactor to help finance an item or service for which there is a special need. Each of these items will directly help the poor. If you would like to contribute a portion or the complete cost of any of the following items, please get in touch with the contact person listed. Click each category below to see full wish lists. If you would like further information about giving to the Ministry of Caring, please call 302-428-3702 or send an email to the Development Office.